We’d love your help. Let us know what’s wrong with this preview of One December by Kyle Hunter. Nikki has loved Mike for as long as she can remember (as early as age seven!) Mike has his own past hurts to resolve, having lost both parents in an accident when he was fourteen. He’s tried to escape those painful memories by leaving New York and starting a new life on the West Coast. New facts indicate, years later, that his parents’ deaths might not have been an acciden Nikki has loved Mike for as long as she can remember (as early as age seven!) Mike has his own past hurts to resolve, having lost both parents in an accident when he was fourteen. He’s tried to escape those painful memories by leaving New York and starting a new life on the West Coast. New facts indicate, years later, that his parents’ deaths might not have been an accident. To ask other readers questions about One December, please sign up. I loved walking through the streets of Paris with Nikki as she spends a year teaching English there. It was a delight to learn that the author had lived in Paris for thirteen years. She takes readers virtually to special places in this romantic city. They experience the sights, sounds, and tastes of France. It was fun to learn the author currently teaches French classes in North Carolina since Nikki was a language teacher too. This story was powerful and insightful about relationships and boundar I loved walking through the streets of Paris with Nikki as she spends a year teaching English there. It was a delight to learn that the author had lived in Paris for thirteen years. She takes readers virtually to special places in this romantic city. They experience the sights, sounds, and tastes of France. It was fun to learn the author currently teaches French classes in North Carolina since Nikki was a language teacher too. This story was powerful and insightful about relationships and boundaries. She talks about how to develop maturity in yourself and relationships with family, friends and in romantic matters. I liked how this author organically brings in the spiritual aspect to this narrative. She shows that just because you’ve accepted Jesus into your heart doesn’t mean everything in your life will automatically go well with you. Messy things will still need to be cleaned up with God’s help of course. But you have to be willing to be willing to do the hard work. I loved how the author shows the two main characters in their struggle to be whole and healed before they are romantically linked. Mike’s a graphic designer and best friends with Nikki’s brother, Danny. After his parent’s untimely death, he moved to San Francisco. The memories of Adam’s Bridge were too painful to deal with. Mike and Nikki have known each other since they were young. They are complex loveable characters who emotionally and spiritually mature throughout the story. They are determined to be two healed individuals running away from nothing. The author talks about issues of faith, love, adventure, personal growth, family, relationship struggles, and the desire to please and trust God in the mist of it all. Mike was learning and growing to, it was “Time to embrace the past, but move on to the future.” He was learning to trust God and keep moving to be what God made him to be. This was a fun story you won’t want to miss. As someone who dreams of traveling but has not had the means or opportunity, I live vicariously through characters in books. In One December, Kyle Hunter gives readers a peek into living in Paris through Nikki’s experience teaching there for a year. But this book is so much more than that. It’s a story about finding yourself, about placing your life and your dreams in God’s hands no matter how difficult, and about growing up. Yes, Nikki’s initial reasons for taking the teaching position in Paris i As someone who dreams of traveling but has not had the means or opportunity, I live vicariously through characters in books. In One December, Kyle Hunter gives readers a peek into living in Paris through Nikki’s experience teaching there for a year. Yes, Nikki’s initial reasons for taking the teaching position in Paris include getting over her broken heart but the character growth she experiences while in France are exponentially far beyond that. And while it’s different than Nikki’s, Mike’s growth in releasing the questions and hurts of his past are just as relevant. Hunter does a stupendous job in letting readers experience the sights, sounds, joys, annoyances, and tastes of Paris (and a few other countries in addition). If you’re looking for a story that allows you to escape to a different place for a short length of time, One December is a book not to miss. Mike and Nikki, childhood friends. He 7 years older than her, but that never mattered to Nikki; Mike has always been her dream. It is Christmas time in Adam’s Bridge. Nikki is all grown, with a college education, teaching high school English and French at her old high school in Adam’s Bridge. She is content; well, as content as she can be for she has not been able to fully release her feelings for Mike. Feelings everyone thinks was just a childhood crush. As the hustle and bustle of preparing the family Christmas dinner ensues, Nikki can’t help but think about Mike. Mike, a graphic designer, moved to San Francisco years ago; he had to escape Adam’s Bridge and the painful memories there. As a child, both of his parent’s were killed in a car accident, leaving him an orphan but not without those who loved him. Taken in by Jim and Catherine, he grew up under their tender loving care; Mike had everything a growing boy could want, except for the parents he missed more then anything. Every three years, Mike returns to Adam’s Bridge for Christmas and this year is the year. Mike has determined that this will be the final year he makes this journey; there’s nothing there but painful memories. At least that was the plan until Ely called to tell him his parents’s accident might not have been an accident after all. Seeing Nikki again stirs feelings Mike had not experienced before. Determined to put Adam’s Bridge, and all the painful memories behind him, Mike apologizes for kissing Nikki telling her no relationship between them could ever be possible. Broken, Nikki signs a one year teaching contract hundreds of miles away from home. In Paris. France. There Nikki’s heart begins to mend as she learns more about herself and her place in the world. One December has everything a reader could want. Romance; intrigue; travel, and mystery. Skillfully written, the reader will find themselves smelling Christmas dinner; feeling broken hearts, and seeing Paris. I thoroughly enjoyed One December by Kyle Hunter. So much so that I’ve purchased her next book. Kyle Hunter weaves together a wonderful story, rich in many areas - faith, love, adventure, personal growth and family. One December childhood friends Nikki and Mike share a passionate kiss. Nikki, who has been in love with Mike since age 7, is ready to move full force ahead. Mike, who always thought of Nikki as his best friend's little sister, is not sure what to do or what he wants. What follows is a time of personal and spiritual growth for both as Mike confronts his past and Nikki confronts Kyle Hunter weaves together a wonderful story, rich in many areas - faith, love, adventure, personal growth and family. One December childhood friends Nikki and Mike share a passionate kiss. Nikki, who has been in love with Mike since age 7, is ready to move full force ahead. Mike, who always thought of Nikki as his best friend's little sister, is not sure what to do or what he wants. What follows is a time of personal and spiritual growth for both as Mike confronts his past and Nikki confronts her family and future. I enjoyed Nikki and Mike's story tremendously! It explored some fun things, like a childhood crush that lasted through the years and living abroad. While I have always thought that living abroad would be a lot of fun, it was interesting to read about Nikki's move to France and put things in a slightly different perspective. I received this book through Just Reads in exchange for my honest review I enjoyed Nikki and Mike's story tremendously! It explored some fun things, like a childhood crush that lasted through the years and living abroad. While I have always thought that living abroad would be a lot of fun, it was interesting to read about Nikki's move to France and put things in a slightly different perspective. One December is the story of Nikki and Mike who have known each other since childhood. Nikki has always had a huge crush on Mike but he has been blind to it until he returns to New York for Christmas and they reconnect. Each of them have their own issues and their holiday ends unhappily with misunderstanding between them. Nikki takes a job in Paris for a year in an attempt to get Mike out of her system. Meanwhile Mike realizes how much she means to him but has to tear down some walls before he i One December is the story of Nikki and Mike who have known each other since childhood. Nikki has always had a huge crush on Mike but he has been blind to it until he returns to New York for Christmas and they reconnect. Each of them have their own issues and their holiday ends unhappily with misunderstanding between them. Nikki takes a job in Paris for a year in an attempt to get Mike out of her system. Meanwhile Mike realizes how much she means to him but has to tear down some walls before he is ready to commit to anyone. Descriptions of Nikki’s experiences while living in Paris were interesting but I would have enjoyed more details about her side trips to other cities in Europe. It was encouraging to watch both Nikki and Mike as they matured emotionally and spiritually. I did think the side story involving Nikki’s parents might have been unnecessary but that is my own personal preference. Overall the story progressed at a decent rate and although at times it was doubtful that things would work out between Nikki and Mike, everything came to a satisfying conclusion. 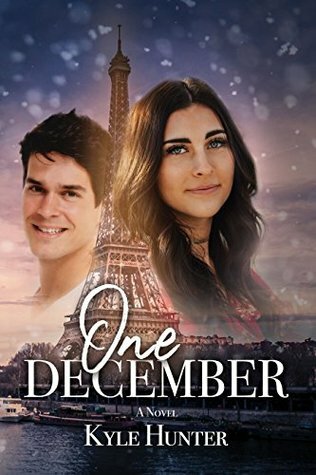 One December is the perfect book for those who love stories about romance between old friends. I write inspirational romance novels and women’s fiction with a twist: My characters sometimes go places. This led me to create the Love on the Move collection of novels. Readers can take a trip with them and experi I love to read and write stories about strong women who still have flaws, but are ready to pursue their dreams, even if it takes them out of their comfort zone . . . or their country.